Truck mixers and tank or tank wagons are to be cleaned regularly. The standing time of the vehicles should be as short as possible. For the various industries and the different residues to be removed, cleaning with high pressure technology offers ideal solutions. It can be individually adapted to tank and boiler sizes and is very easy to make automatable. URACA offers a wide range of products for these applications. Depending on the transported product, residues in tank and tank car containers are formed and must be removed on a regular basis. This prevents contamination of the cargo and the operational readiness of the car is maintained. Tank and tank wagons are used in the chemical industry, for example for the production of adhesives, plastics, paints and varnishes or for transporting materials such as oil, bitumen or resins. Different methods can be used to clean the boiler and tank cars. Common are manual cleaning, cleaning with chemicals or high-pressure cleaning with water. Tank and boiler car cleaning requires technology that provides high pressure water. Water jets and nozzles must be flexibly controllable and adjustable. The high-pressure technology offers many advantages over the other methods. It requires no chemical additives, uses environmentally friendly water as a cleaning medium and works quickly and gently. Even places that are hard to reach in the tank and boiler cars are easy to clean. The efficient systems have quickly paid for themselves. The high-pressure water jet technology is applicable in explosion-proof areas. The cleaning staff do not have to get into the containers and do not come into contact with dangerous substances. With the possibility of evaporation, the cleaning time can be further shortened. 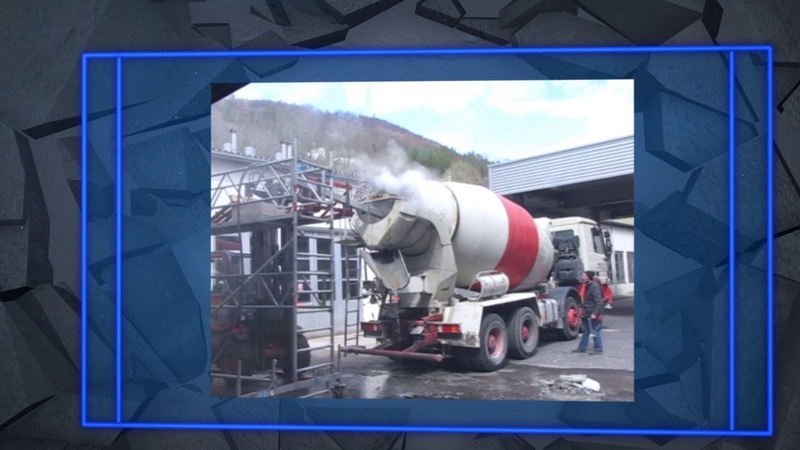 In Germany, around 12,000 truck mixers are in use every day. Depending on the different conditions, deposits form in the mixer drums, which harden quickly and take up more and more space. Without regular removal, it is necessary to transport tons of superfluous ballast, which limits loading capacities and unnecessarily generates energy and therefore avoidable costs. High pressure truck mixer cleaning uses high pressure pump units, high pressure cleaning tools and lance positioning devices. The cleaning tool runs into the mixer via the positioning device. High pressure water then removes the deposits. The cleaning staff control and check the cleaning conveniently by remote control. The dusts generated during the cleaning process bind the water directly at the point of origin, which ensures health-friendly and safe working conditions. Used water can be collected and used, for example, for mixing new concrete. The cleaning is possible both mobile and stationary at a washing place. A cleaned drum reduces fuel consumption and the risk of tilting of the truck mixer in curves; it increases the loading capacity and the service life. Since the high-pressure cleaning delivers excellent results after a short time, needs-based intermediate cleaning processes can be carried out quickly in addition to the main cleaning procedures. The service life of the mixer is considerably reduced compared to manual cleaning. For efficient cleaning, the technique must provide high pressure water jets. The cleaning systems are to be designed so that they can enter the mixer drum and are externally controllable. URACA offers suitable complete solutions and high-pressure products for tank wagon, tank truck and truck mixer cleaning. Only cleaned boiler cars, tank cars and truck mixers can be used over long periods of time and work economically. The high pressure technology offers ideal solutions to maintain the loading capacities and to thoroughly remove residues or deposits. URACA has a lot of competence and years of experience in this field. If you need assistance with the selection of suitable products or if you have questions about the cleaning method, contact URACA now. The experts from URACA are happy to assist you and give you comprehensive advice.